The median financial advisor pay in 2018 was $88,890 – well above the national average, according to the Bureau of Labor Statistics (DOL). However, pay can vary widely by state, city and level of experience. The profile of your clientele can have an effect as well. We’ll cover all you need to know about financial advisor compensation as well as job requirements and career outlook. A financial advisor meets with clients and makes recommendations on how they can improve aspects of their financial life. This can include guiding clients through everything from creating budgets to retirement planning. You may also manage investment portfolios on behalf of individuals. However, most advisors choose to specialize in one area such as taxes or estate planning. In fact, the term financial advisor doesn’t apply to just one profession. It’s more of a blanket term that includes financial planners, insurance agents, stock brokers, tax professionals and even some bankers. DOL data shows that the median annual wage for financial advisor in 2018 was $88,890. That shatters the national average wage of $38,640. But there is a big difference between the highest- and lowest-earning financial advisors. In 2018, the lowest 10th percentile of financial advisors earned $41,590. Meanwhile, the top 10th percentile made $208,000 or more than five times as much. One factor that drives this gap is industry concentration. As we mentioned before, financial advisors wear different hats. Below, we detail the the top earning industries in the financial advisory space, according to the latest DOL data. Below, we break down how much the top and lowest earning financial advisors make. When it comes to pay, there are a few different ways that a financial advisor can earn money. Some financial advisors work on commission. These advisors will make a set amount every time they sell a certain product or service. These can include insurance products, mutual funds and other securities. However, making your earnings based on commission may open you to potential conflicts of interest. For example, you may encounter an incentive to recommend a specific investment over another because it makes you more money – even if you believed the other investment would have been more suitable for your client’s risk tolerance and financial goals. In fact, you may even unwittingly put yourself in a conflict of interest if you rely too heavily on commissions. But, it’s less common for a financial advisor to earn their pay strictly off commission if they are certified with some of the common financial advisor certifications. 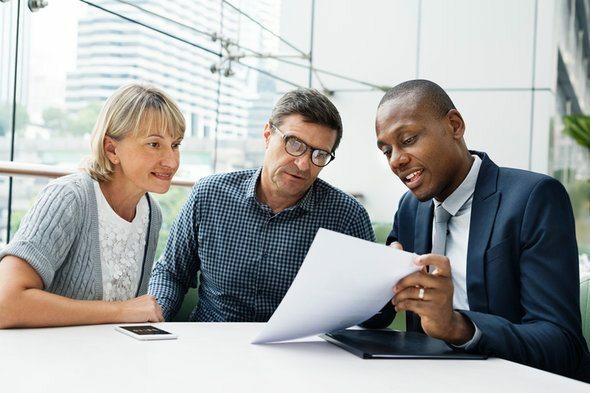 The certifications and licenses are independent of pay structure, but some legally require advisors to act in the best interests of their clients. These financial advisors will usually earn their money through different means. As an example, let’s say a financial advisor charges a 2% annual fee on assets under management. If the advisor handles $10,000 of your assets, then you will have to pay a fee of $200 (2% of $10,000). As you can see, the fee doesn’t amount to much. That’s why fee-only financial advisors typically work with wealthy clients who need someone to manage a large portfolio. But regardless of the structure, fee-only financial planners are looked on as favorable from a consumer’s perspective, because they make money solely based on the services they’re asked to provide. Some financial advisors earn a salary. This is most common with an advisor who works for a bank or a different financial institution. Salaried advisors may also earn a bonus or commission for selling certain products. The DOL projects the employment of financial advisors would have jumped by 15% between 2016 and 2026. The climb paces much higher than the average for all occupations in the country. The government ties this growth to an aging population that will soon demand advice around retirement planning. In particular, the DOL sites the shift to individual retirement accounts (IRAs) and 401(k)s from traditional pensions as a main driver behind the demand for financial advice. But If you’re interested in becoming a financial advisor, note that some states offer more opportunities than others. The latest DOL data shows that New York ranks among the highest in terms of financial advisor employment. More than 27,000 people serve in the profession as personal financial advisors. We detail some of the the main points below. To get a better idea of what certification is like for a financial advisor, consider a few common examples. In order to become a certified financial planner (CFP), you need to meet certain educational requirements, you need to have a few years of experience and then you need to pass the CFP exam. Getting certified as a chartered financial analyst (CFA), which is one of the most-respected certifications you can have, is even more challenging. You need to have a bachelor’s degree and four years of experience. Then you need to pass three six-hour exams in order to receive certification. If you want to specialize in taxes, becoming a certified public accountant (CPA) will help. That certification requires certain coursework, two years of experience and passing an exam. Any advisors who provide investment advice are required to earn a Series 65 license and uphold then uphold certain standards. Financial advisors are experts who help people to make wise financial decisions. The term financial advisor actually covers a number of different professions and each profession specializes in a slightly different area. Anyone who wants a build a career as a financial advisor will need a bachelor’s degree plus a certification that relates specifically to what they want to do. It can take years of hard work to earn certification but it could all be worth it considering the average salary for a financial advisor was $88,890 in 2018. Many financial advisors say it isn’t just about the money, though. They find their jobs fulfilling because every day they get to help people take control of their financial lives. There are a number of factors to consider when choosing a financial advisor. Think about your financial situation. How much do you have saved and how do you have it saved. What are your financial goals? Do you need help creating a college fund for your children? Remember that financial advisors usually specialize in one area. One advisor might focus on planning for retirement while another focuses on income taxes. So be sure to find a financial advisor with the expertise you need. Our SmartAsset financial advisor matching tool can help you find a person to work with to meet your needs. First, you answer a series of questions about your situation and your goals. Then the program narrows down thousands of advisors to three fiduciaries who meet your needs. You can then read their profiles to learn more about them, interview them on the phone or in person and choose who to work with in the future. This allows you to find a good fit while doing much of the hard work for you. As you look for an advisor, look some someone who has earned the proper certifications – like one of these top 10 financial certifications. So if you are looking for particular help with your taxes, you might want to find a certified public accountant (CPA). You should be especially careful when looking for investment advice. Investing in the stock market involves risk and not all advisors are properly trained to provide sound advice.